Jacobsen, a Textron Inc. (NYSE: TXT) company, announced today that production has begun on the new Jacobsen HoverKing hover mower. 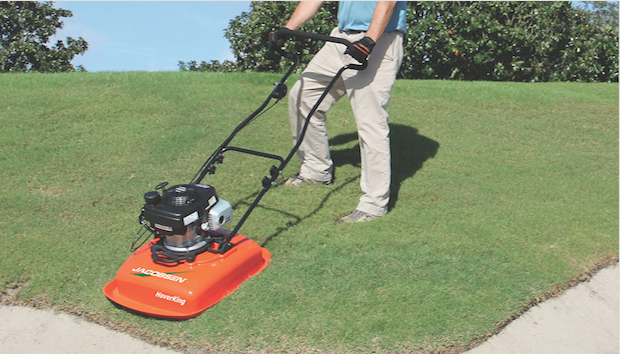 “Hover mowers typically maintain the most sloped areas on a golf course where mowing is very difficult,” said Chris Fox, Product Manager for Jacobsen. Lightweight yet extremely durable, the HoverKing also features integrated handle mounts that stand up to the rigors of daily use. Another exclusive feature of the HoverKing is that it offers a height-of-cut of 7.6 cm (3 inches), the highest in the industry. In addition, the HoverKing offers three cutting system options: metal blade, metal edge with nylon blade or nylon string.